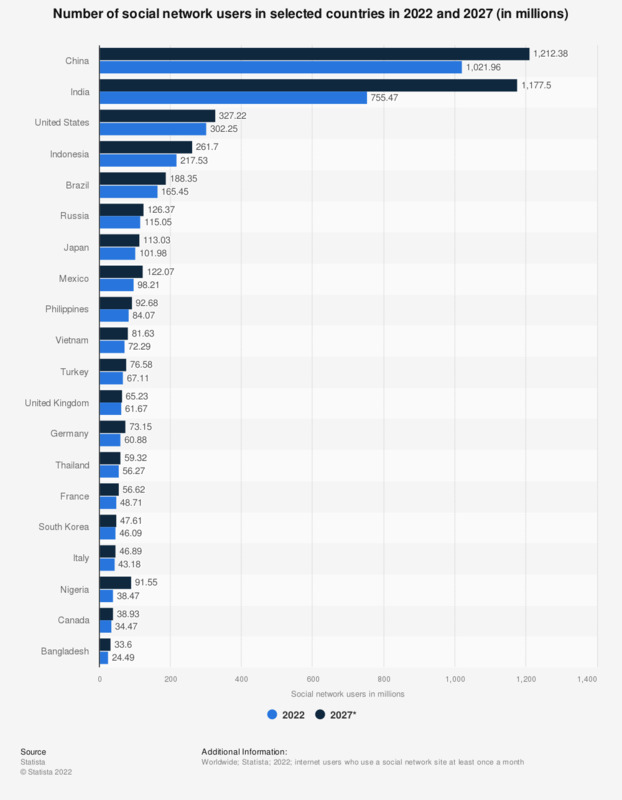 This chart illustrates the projected number of social network users in 2018 and 2023 in selected countries. Statista projects that close to 800 million Chinese internet users will access social networks in 2023, up from 673.5 million social network users in 2018. Social network usage has been constantly undergoing double-digit growth which is projected to last until 2016 after which it will slow down to single-digit growth until 2017. Social networking growth has been heavily influenced by mobile device usage development and increasing mobile internet penetration rates worldwide. Social network users benefit from an expanded network and the ability to connect and keep in touch with others. Social networking is one of the most popular online activities worldwide and social media companies such as Facebook, Twitter and Weibo are very influential in terms of online interaction and digital marketing. Social networking is also a growing force in the area of e-commerce as the niche of social commerce is slowly expanding because of increased social feature integration on e-commerce sites. Consumers can login to websites with social network IDs to simplify their registration and unify their online experience. Facebook is the most popular social login network ID, followed by Google and Yahoo. Social network usage is closely linked with concerns regarding online privacy. As of July 2013, more than 66 percent of US internet users had a photo of themselves online. Recently, internet users have been rethinking the common display of sensitive data such as date of birth or email addresses and have increasingly begun to commit to online privacy and anonymity management methods.